The KNIME Database Extension provides a set of KNIME nodes that allow connecting to almost all JDBC-compliant databases. These nodes reside in the Database category in the Node Repository, where you can find a number of database access, manipulation and writing nodes. The database nodes are part of every KNIME Analytics Platform installation. It is not necessary to install any additional KNIME Extensions. as well as the generic Database Connector node. The database-specific connector nodes already contain the necessary JDBC drivers and provide a configuration dialog that is tailored to the specific database. It is recommended to use these nodes over the generic Database Connector node, if possible. 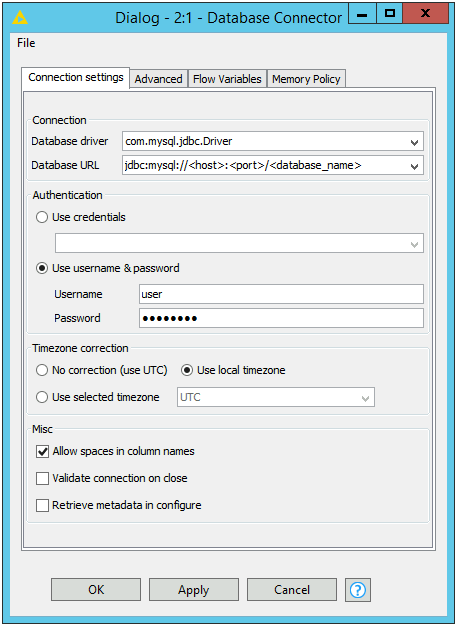 Database URL: A driver-specific JDBC URL is required. Please consult the vendor documentation for the JDBC driver you are using. Authentication: Login credentials can either be provided via credentials flow variables, or directly in the configuration dialog. For the remaining settings please consult the Database Connector node description. 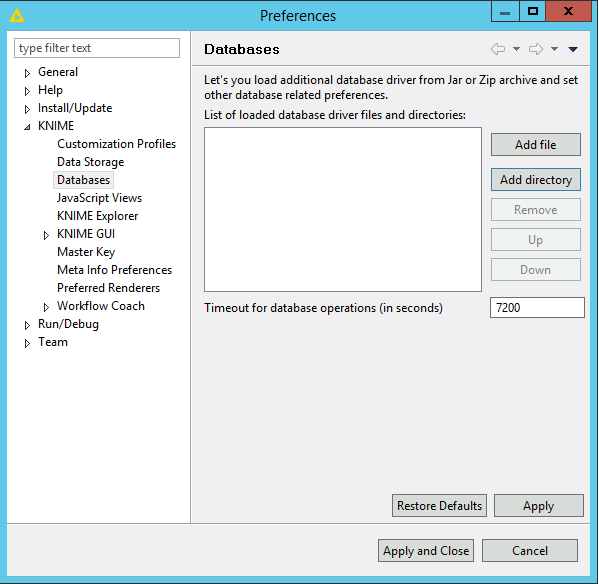 For some databases KNIME Analytics Platform does not contain a ready-to-use JDBC driver. In these cases, it is necessary to first register a vendor-specific JDBC 4.1 driver in KNIME Analytics Platform. Please consult your database vendor to obtain the JDBC driver. To register your vendor-specific JDBC driver, go to File → Preferences → KNIME → Database Driver. Add file: Click here, if the driver is provided as a single .jar file. Add directory: Click here, if the driver is provided as a folder that contains several .jar files. Some vendors offer a .zip file for download, which needs to be unpacked to a folder first. Once you have successfully connected to your database, there is a set of nodes that provide in-database data manipulation, such as row filtering, joining etc. Additionally, there are nodes to read, write or delete data from a database, or to to run custom SQL statements, such as the Database SQL Executor node. Please consult the example workflows, which are available in KNIME Analytics Platform in the KNIME Explorer View, when connecting to the EXAMPLES server. 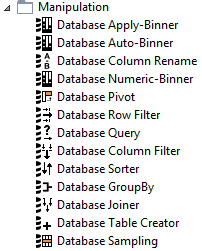 Under 01_Data_Access → 02_Databases you will find a variety of example workflows that demonstrate how to use the database nodes.